Jung believed that introversion and extraversion were present in everyone, but that one attitude-type is invariably dominant. When external factors are the prime motivating force for judgments, perceptions, affects and actions, we have an extraverted attitude or type. Jung believed that type differentiation begins very early in life, so that it might be described as innate. In general, the extravert trusts what is received from the outside world and is not inclined to examine personal motivations. Although everyone is affected by objective data, the extravert’s thoughts, decisions and behavior are determined by them. 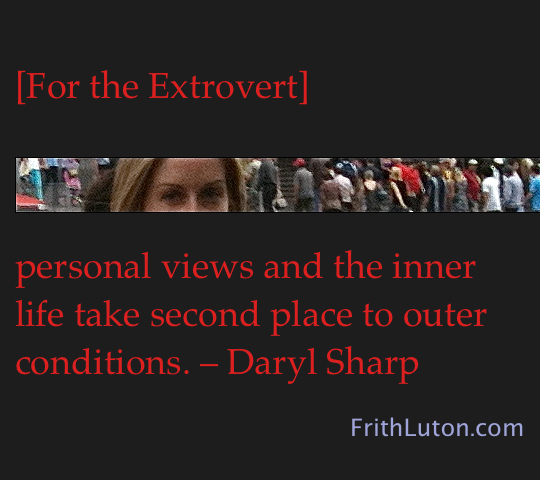 Personal views and the inner life take second place to outer conditions. The psychic life of the extreme extraverted type is enacted wholly in reaction to the environment, which determines the personal standpoint. If the mores change, he adjusts his views and behavior patterns to match. This is both a strength and a limitation. Extraversion is an asset in social situations and in relating to the external environment. But a too-extraverted attitude may result in sacrificing oneself in order to fulfil what one sees as objective demands – the needs of others, for instance, or the requirements of an expanding business. The form of neurosis most likely to afflict the extravert is hysteria, which typically manifests as a pronounced identification with persons in the immediate environment. The extravert’s tendency to sacrifice inner reality to outer circumstances is not a problem as long as the extraversion is not too extreme. But to the extent that it becomes necessary to compensate the inclination to one-sidedness, there will arise a markedly self-centered tendency in the unconscious. All those needs or desires that are stifled or repressed by the conscious attitude come in the back door, in the form of infantile thoughts and emotions that center on oneself. The danger then is that the extravert, so habitually and apparently selflessly attuned to the outside world and the needs of others, may suddenly become quite indifferent.